Firstly, I would like to apologise for the lack of pictures/my face in this post. I was having one of those days where it was my destiny to blink or pull an awful face every time a picture was taken – this was the best of the bunch. 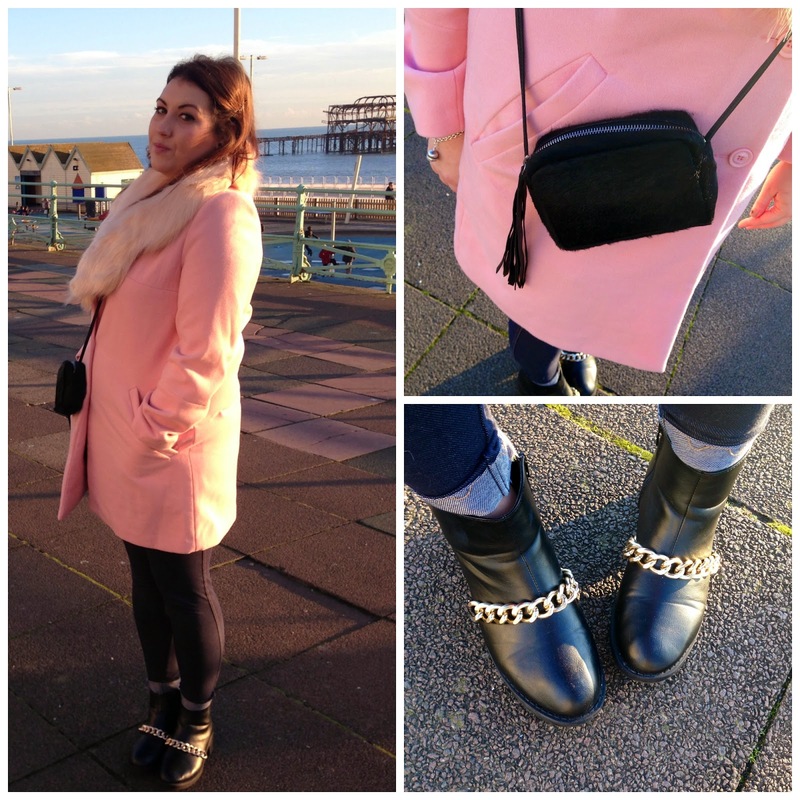 I thought I’d share this OOTD as it was a big bold decision to wear such a bold, non-black coat. But sometimes fortune favours the bold (or is it the brave?) and every time I have worn it out I have had some really lovely comments – which just goes to show that you can’t always be scared to take risks or step out of your comfort zone. I hope that in 2015 I can embark on a journey towards a less black wardrobe. This lovely oversized pale pink boyfriend coat is actually from Blue Inc. which is not somewhere I had even thought of shopping before, I always thought they were just menswear, but they have got a fairly good womens offering now. The cream fur stole that Joe ordered me in the Simply Be partner styling post matched the coat perfectly, and made it a bit more wintry. The boots are also from Blue Inc. Under my coat I had paired my old faithful New Look leggings, with a plain black top and a few pendant necklace. This outfit also featured my #AAAsecretsanta gift – This lovely black Pony Skin Bag from the lovely Vieve Wright – I have used it so many times already!